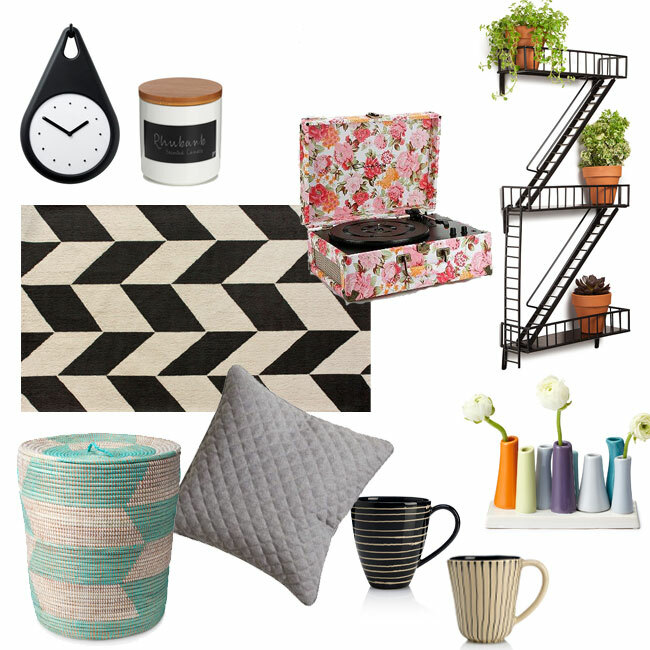 Clock: Ikea, Scented Candle: M&S, Record Player: Urban Outfitters, Fire escape shelving: Uncommongoods, Vases: Uncommongoods, Black Mug: M&S, Cream Mug: M&S, Cushion: H&M, Basket Hamper: Uncommongoods, Rug: Floors Usa. Ever since Dave & I got our little house together this year home decor and interior design have been at the fore front of my thoughts. I find myself shopping for cushions and candles instead of dresses and jewellery. Its a slight obsession to continue to better our home by making it our own through the decor. Where do you guys shop for home decor and furnishings? That fire escape shelving is amazing, I want, I want, I want!!!!!! oooh i love love love the fire escape shelves! Gorgeous items :) I love your blog and I have followed you with Bloglovin , if you ever get a chance to check out my blog I would be delighted thanks! I like the fire escape shelving, I've never seen anything like it before.